He's big. He's scary. Best of all, he's purple. 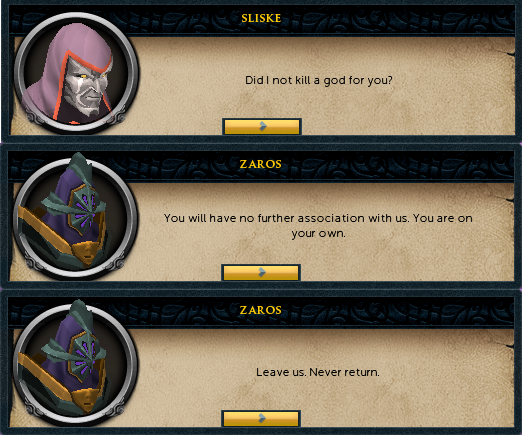 The Empty Lord, Zaros, is returning to Gielinor, but only the World Guardian can help him. Play your cards, make your choices, and decide... the Fate of the Gods. Do You Want to Build a Zaros? 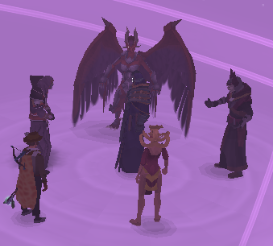 The gods are returning to Gielinor but something is preventing the arrival of Zaros. Help Azzanadra to bring his god to Gielinor and find out more about Zaros and the elder gods along the way. Speak to Azzanadra directly south of the Eagles Peak lodestone, north of Arandar. This is a voice acted quest; to get the full experience turn down the Tswift and turn up the RS volume! To begin, speak to Azzanadra directly south of the Eagles Peak lodestone, north of Arandar. He says that it is time for Zaros to return but there is one obstacle which only you can hurdle. Accept the quest. He will tell you that the world gate is hidden in the shadow realm and the only person who can get it out is Sliske. Sliske will appear and pull you into the shadow realm. Here, he will hint that you should sabotages Zaros return. 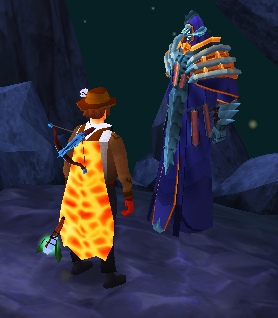 When you return back to the normal realm, Azzanadra will ask you what you and Sliske discussed. You can choose any option; it does not affect the rest of the quest. 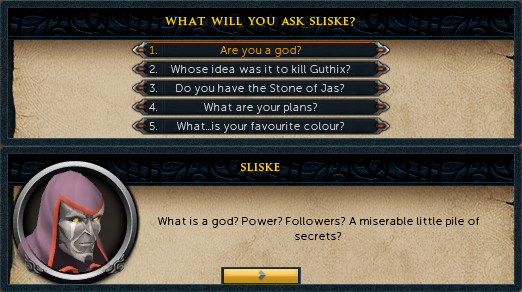 Following this, Sliske will give you the world gate combination for Freneskae. The combination is done in a right-left-right fashion. To move the ring to the right, click on the pedestal to your character's right and vice versa with left. After a correct symbol the gate will quickly flash and make a sound effect, so even if you don't know the combination it should be easy to figure out. 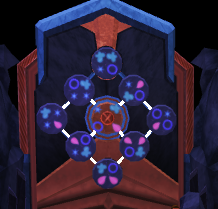 When you have entered the correct combination, Sliske will bring the world gate back into the material realm. Now the gate is ready for transport. Freneskae is a pretty dangerous area, but at least it's not the south side of Chicago. You will come across volcanic features and a myriad of lightning strikes. Try your best to avoid these. The ground should flicker before a lightning strike and some of the volcanic features spit out lava in an ordered pattern. There will also be healing arches in Freneskae which can help. Along the way, you will come across several crystals which share a bit of Zaros' history. If you wish, you can pick these up along the way. You should bring high healing food and a beast of burden to come with you. It will take several minutes to get to your destination, an area called The Sanctum. Bringing the engrammeter from Mahjarrat Memories can be advantageous. Enter the World Gate and you will find yourself in A Whole New World (Yep, the song will be stuck in your head for the entire day now). Activate the engrammeter immediately upon arrival (if you have one). Head west and jump across the ledge. Following this, walk across the rock formation to the northwest. Walk around the volcanic geysers and stop under the healing arch, if necessary. Continue along the path, crossing over the stepping stones. Climb the cliffside up and run across the wall overhang. Climb the cliffside down. Now, slide down the slope to the west. Run past the volcanic formations (try best to avoid the lava) and stop under the healing arch if necessary. Head to the area directly south of the healing arch (you will have to run over the volcanic geysers). Climb the cliffside and run over the arch. Climb down the drop and keep following the path until you come across a rock opening. Traverse this and enter the opening nearby. Once in the Sanctum activate the memoriam device in the middle to get rid of any crystals in your inventory. Now head to the rotating dial door. As you have guessed, this is a puzzle. The objective here is to choose the position of the center to see symbols must be where and continue. Each symbol must connect to one another. If this is not possible, then move the position of the center and try again. An example of an almost completed puzzle is seen below. You will have to do this three times. Once you have completed this, enter through the opening. You will be doing some fighting here, so bring some combat gear. You can bank and come back if you wish. Magic and Range is popular here since you will have to do a fair bit of running, however Melee also works as well. You should bring at least tier 75 weaponry and a beast of burden or a very strong combat familiar. Head to the center of the room (the area with the purple cloud in the middle) and four nihils will appear. They will begin rolling in straight directions, however which direction they roll in changes each time (though it is not random, see below). If you are caught in the tracks of one of these nihils you will be hit severe damage. Ice Attacks with Magic/Weak to Range Freezes you for 5-6 seconds (Frequently) Use the anticipation ability as frequent as you can. This will prevent the Nihil from freezing you for 10 seconds. If you do manage to get stunned, use the freedom ability to escape. Blood Attacks with Melee/Weak to Magic The creature will yell "hiss", causing all damage you deal healing it for several seconds. Summoning familiars can hit through the special. Use Threshold/Ultimate abilities after its Special Attack has just ended. Shadow Attacks with Range/Weak to Melee Casts an Area of Effect attack. Also, every time you are within vicinity of the nihil your screen will turn darker. Hit and run as the design of the room allows you to put some distance between you and the Nihil. Smoke Attacks with Magic/Weak to Range A dark mist forms on the last square you were standing on which will lower your stats Bring a Super Restore Potion. This is arguably the easiest Nihil; if you kill it fast enough you won't need to worry about the stat draining effect. If you get all four Nihils to attack you at once and kill them all, you will gain "The Annihalator" title. The general strategy for this is to attack the ice nihil last and kill either the blood or ice nihil first. Then, move onto the other nihils. Before every special attack the Nihils shout "Hiss". Keep an eye on this so you can avoid their attacks. The nihils do not run in random directions. Ice and Shadow always run north to south or vice versa. Blood and Smoke always run east to west or vice versa. Thus, you should kill either blood then smoke or ice and shadow (unless you are going for the "The Annihilator" title). This will give you a safe lane after killing this first of the pair of nihils. Once you have defeated the four nihils, you will be able to proceed through the cavern and onto the next area. This area is called the Cradle, and is one of the most important areas to the quest. Here, the mysterious entity that has been following you will finally reveal itself. There's a slight problem - here, you are standing in front of the youngest of the five Elder gods, Mah. She's big, she's sleepy, and she's terrified. Her nightmares are able to materialise into life, which is very bad for you. Zaros will start speaking to you. He has no intention of harming you, and will then decide you need a safer place to converse. He will pull you into your own mind, and here, you can ask him almost any question you could think of. He will tell you everything - his intentions, his thoughts, his beliefs, his opinions, on everything Zaros related. After you and Zaros are finished chatting, he will say that he needs your help. He needs you to survive Mother Mah's nightmare before he can proceed with his plan - to create a new physical form to inhabit. Zaros will also give you an offer - he can assist you if you let him place his essence inside of you. He will not be able to help directly, but, if you let him in, you will be given UNLIMITED casts of all Ancient Magick combat spells, and INFINITE prayer points, if you are using Ancient Curses. He is also able to help absorb some of the damage you will take from the fight. Upon initiating the fight, letting Zaros in or not, Mah's nightmare timer will begin ticking down. You must survive the entirety of this battle, as leaving the area forces you to restart. During the nightmare, Muspahs of 3 different combat styles will spawn, and attack you. Also, every time Mah clenches her fist, your screen will rapidly zoom in and out, you will hear a scream, and take around 1500 damage. The only reason this does not scatter the very fibre of your existence across Freneskae is due to your god-resisting powers of the World Guardian, and that is why Zaros needs you. If you use Ancient Magicks on the Muspahs, you will hit for double damage, so your best hititng Blood spell is reccommended - your main priority is survival, and the healing powers of Blood spells will help with this. 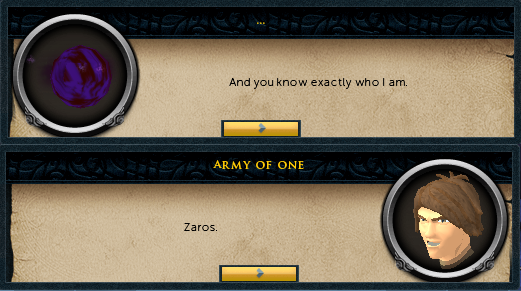 Upon surviving the nightmare, Zaros will give you more instructions. He now wants you to descend into the Elder Halls of Freneskae, which are located by Mah's left fist, and weave a dark simulacrum out of the divine energy of Mah herself. Descend into the halls. Here you will find your very own Elder Artifact! This is called "The Measure". The Measure is a small object that emits a sound exactly like a sonar radar. Around the halls, you will see Mah wisps floating around. However, they are transparent, and cannot be harvested. To harvest them, you must pick up the measure, place it near them which will enable you to begin harvesting. You must gather 250 Mah energy - you can get more by placing Mah memories into the Energy rift - and weave a Simulacrum. You may either weave a dark one, or a light one - a light simulacrum will reject Zaros's essence, thus sabotaging him. The choice is 100% up to you. Weave the Simulacrum, and return it to Zaros who is located in the Cradle. Return whichever Simulacrum you wove, and give it to Zaros. He will form a new body, but this will cause Mah to wake up entirely. Zaros will quickly teleport you both back to the World Gate, right as Mah attempts to crush you in her hand. Close call! Talk with Zaros. He will tell you a little more about himself, including his one big flaw, that may change your mind about supporting him. You will then both leave the hostile plane of Freneskae, and Zaros will assemble his followers: Nex, Char, Azzanadra, Sliske, and you. Finally, he will turn to you. He will thank you for your help and will reward you whether you helped him or not. He will then offer you a shard of his own body - say his farewell - and depart. Congratulations, Quest Complete! After the quest, there are a few more rewards you may attain. 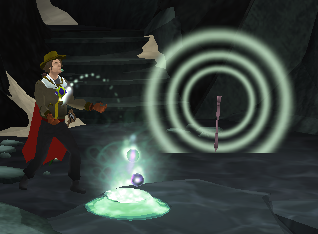 The first involves using The Measure, and this can earn you an incredible chunk of Divination XP. You can take The Measure to four locations, and upon placing it you will find an Elder Chronicle. 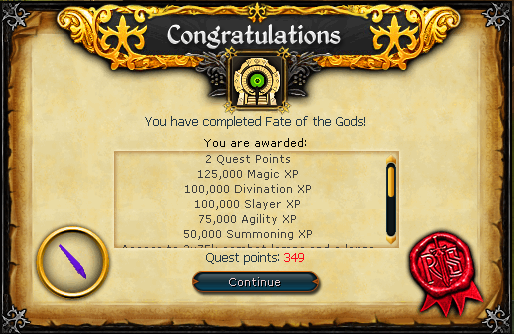 When you collect this chronicle, you will earn 50,000 Divination XP, totalling 200,000. A "Survivors Lamp" from Azzanadra at the Temple of Senntisten. This will award 75,000 XP in a combat stat of your choice (excluding Prayer and Summoning) over 80 three times.This requires completion of The Temple at Senntisten. A Large Prismatic Lamp from Wahisietel in Nardah. This requires completion of the Ritual of the Mahjarrat quest. If you visit the Empyrean Citadel throne room, and then attempt to leave, Sliske will appear. You may ask him one question, and he will reward you - you are now able to see into the Shadow Realm without a Ring of Visibility. This requires completion of The General's Shadow and Ritual of the Mahjarrat. This can be done during the quest, but in order to earn the title "The Annihilator" you need to kill all four Nihils where they are all attacking you simultaneously at any point during the battle. The cosmetic head overrides "The Helm of Zaros" and "Crest of Seren" for returning all the Memoriam Crystals to the Sanctum. 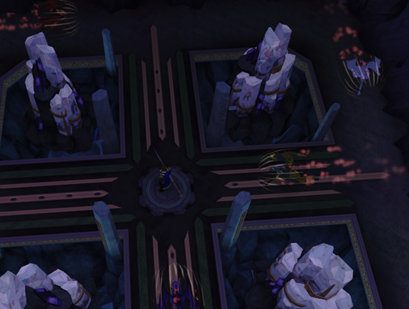 Zaros' crystals can be found around the approach, the Sanctum, and the Cradle. Seren's crystals are a bit tougher to get. You will have to tag crystals at Seren's shrine in the approach to get these. Every 20 tags you will get a crystal and there are four crystals, so 20 tags in total are needed. However, each tag increases the frequency of lightning strikes. Getting to 80 tags will be difficult; it is suggested bringing a beast of burden full of food and an engrammeter. Also, playing on low detail will be helpful as the lightning strikes may decrease FPS. 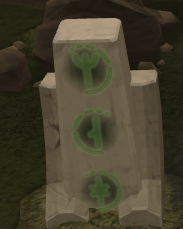 By talking to the Guthixian High Druid at Guthix's shrine, you may add a teleport to the World Gate to your Sixth-age circuit. You can return to the cradle and fight Muspahs. Ancient Magicks deals twice the damage against Muspahs when compared to other monsters. If you speak with the Oracle on Ice Mountain post-quest, she will divulge the name of an Elder God. 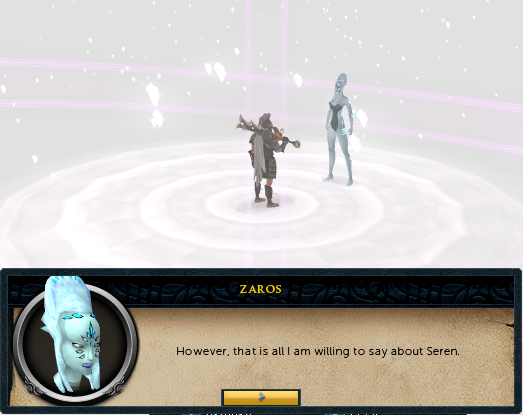 The quest reveals much about Seren as well as Zaros. Using the memoriam crystals as a source, you should be able to figure out the history between the two. It appears Mah created both Zaros and Seren as companions. Zaros was made of dark energy while Seren was made of light energy. Neither Zaros nor Seren could/can concentrate while being around one another, for whatever reason. Eventually, possibly due to this, Zaros left Freneskae for other worlds while Seren stayed to nuture Mah as she felt in debt to her. Eventually however, Seren left for other planets as well. The exact relationship between Zaros and Seren (whether it be familial and/or romantic) is not shared. Depending how far in the future you are reading this, the quest shows what is/was the only picture of Seren available at the time of release. Along with the gods, the crystals discusses the Mahjarrat. The crystals tell the player that the Mahjarrat were also formed by Mah and Zaros felt attachment to them due to this. 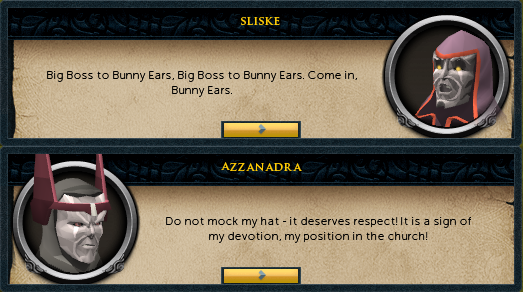 Speaking with Azzanadra and Sliske during the quest also reveals humorous dialogue about Azzanadra's hat.